[135 Pages Report] The sandboxing market size is expected to grow from USD 2.90 billion in 2017 to USD 9.40 billion by 2022, at a Compound Annual Growth Rate (CAGR) of 26.5%. The base year considered for the study is 2016, and the market size is calculated from 2017 to 2022. Enterprises are using various advanced security techniques and procedures to provide more resilient protection to the IT infrastructure, and secure applications and business-sensitive information. On the other hand, cybercriminals are also developing advanced practices to enter the organizational assets. They are using multivector and multistage attack strategies to target the networks of organizations. Hacking can be used for malicious purposes to destroy someone’s business applications as well as a means of getting some financial gain. Today’s hacking teams are very active with the usage of comprehensive hacking techniques, which are difficult to detect for a long time. The increased level of sophisticated attacks would create the need for advanced security solutions for driving the sandboxing market. 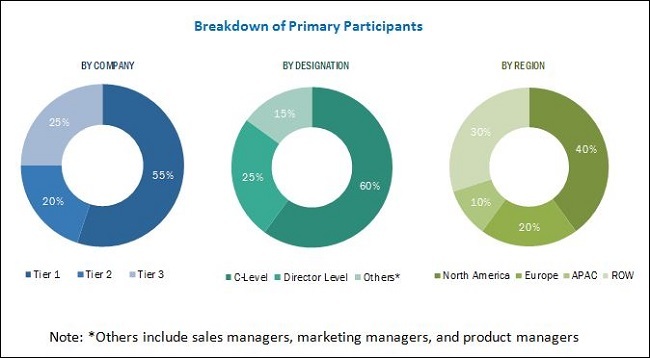 The sandboxing market ecosystem includes major vendors, such as Check Point Software Technologies Ltd. (California, US); Cisco Systems, Inc. (California, US); FireEye, Inc. (California, US); Fortinet, Inc. (California, US); Juniper Networks, Inc. (California, US); Palo Alto Networks, Inc. (California, US); Sophos Ltd. (Oxfordshire, UK); Symantec Corporation (California, US); Ceedo Technologies (2005) Ltd. (Netanya, Israel); Forcepoint (Texas, US); McAfee LLC (California, US); SonicWall Inc. (California, US); and Zscaler, Inc. (California, US). Other stakeholders include cloud service providers, system integrators, sandboxing service providers, consulting firms, Information Technology (IT) service providers, Value-Added Resellers (VARs), enterprise users, and security and access management technology providers. In February 2017, Sophos acquired Invincea that enabled Sophos to incorporate Invincea’s endpoint security portfolio, capable of detecting and preventing unknown malwares and sophisticated attacks through its patented deep learning neural-network algorithms. In February 2017, Palo Alto Networks acquired LightCyber, which brought LightCyber’s highly automated and behavioral analytics technology, capable of identifying attacks based on behavioral anomalies inside the network, into Palo Alto Networks’ suite of security solutions. In February 2017, Symantec unveiled many new innovations in its cloud security platform including new malware analysis service, speeding deployment of on-premises policies to the cloud, cloud workload protection for AWS and Microsoft Azure, and cloud-based Web Application Firewall for AWS. What are the new opportunities which the sandboxing vendors are exploring? Detailed analysis and profiling along with competitive leadership mapping to get detailed information about the market competitors on the basis of their product offerings and business strategies. The report reviews the major players who offer sandboxing services. Additionally, the report also outlines the findings and analysis on how well each sandboxing vendor performs within the MarketsandMarkets criteria. The global sandboxing market size is expected to grow from USD 2.90 billion in 2017 to USD 9.40 billion by 2022, at a Compound Annual Growth Rate (CAGR) of 26.5%. The major growth drivers of the market include increased sophistication levels in attacking techniques, the need to secure enterprise networks from advanced malware and security breaches, and stringent security compliances and government regulations. Sandboxing Market is a security mechanism, which is used to test unverified codes, untrusted users, and untested websites in a virtual environment without damaging the performance of the Operating System (OS). It is the most recent and sophisticated technology to emerge. Sandbox can be referred to as a separate area for developers to play without harming the outside hosting environment. Organizations deploy sandboxing solutions to meet the regulatory compliance standards, such as Payment Card Industry Data Security Standard (PCI-DSS), Health Insurance Portability and Accountability Act (HIPAA), Gramm-Leach-Bliley Act (GLBA), Sarbanes-Oxley Act (SOX), and Federal Information Security Management Act (FISMA). With proper sandboxing solutions, an organization can effectively manage the security of its IT infrastructure and improve business continuity. The sandboxing market is segmented by solution and service, organization size, vertical, and region. The solutions segment in the market is expected to have a larger market size than the services segment during the forecast period. The reason behind the high growth rate is the increased need to secure Information Technology (IT) infrastructure from advanced cyber-attacks, such as zero-day attacks, ransomware, and malware. The managed services segment is expected to grow at a higher CAGR during the forecast period. However, the professional services segment is expected to have a larger market share in 2017. The integrated solutions segment is expected to grow at a higher CAGR during the forecast period. The large enterprises segment is expected to account for a larger market size in 2017. However, the Small and Medium-Sized Enterprises (SMEs) segment is expected to grow at a higher CAGR during the forecast period. 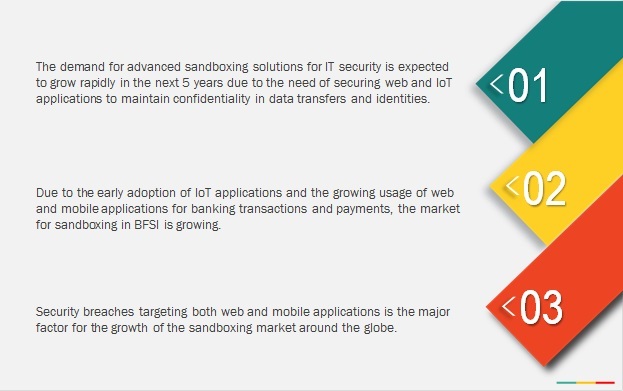 Sandboxing Market services have been deployed across various industry verticals, including government and defense; Banking, Financial Services, and Insurance (BFSI); IT and telecom; healthcare; retail; education; and others. The BFSI vertical is expected to grow at the highest CAGR during the forecast period. However, the government and defense vertical is expected to have the largest market size in 2017. On the basis of regions, the global sandboxing market has been segmented into North America, Europe, Asia Pacific (APAC), Middle East and Africa (MEA), and Latin America to provide a region-specific analysis. The North American region, followed by Europe, is expected to be the largest revenue-generating region for sandboxing service vendors in 2017. In the developed economies of the US and Canada, there is a high focus on innovations obtained from Research and Development (R&D) and security technologies. The APAC region is expected to be the fastest-growing region in the market. The growth in this region is primarily driven by the increasing adoption of Internet of Things (IoT) devices and the Bring Your Own Device (BYOD) technology within organizations. The Banking, Financial Services, and Insurance (BFSI) is an industry term for companies such as commercial banks, insurance institutes, and nonbanking financial organizations, which provide financial products and services. The BFSI industry is always on the lookout for sandboxing products and services that could protect the industry’s employees, customers, assets, offices, branches, and operations, and this vertical therefore holds a significant percentage of the total sandboxing market. The government vertical consists of four institutional units, namely, central government, state government, local government, and social security funds. The defense vertical deals with a system against various attacks using several independent methods. Government and defense agencies across the globe handle critical and sensitive information by serving citizens and collecting intelligence. Cyber-attacks and vulnerabilities have increased the security breaches in various government and defense agencies. Retail industries include the selling of consumer products and services to clients through multiple channels. This vertical is one of the top cost-conscious sectors and it is the most targeted vertical for cyber-attacks because of the potential payouts and huge number of monetary transactions via VISA, master card, and credit cards. Retail organizations must secure network points that include e-commerce websites, third-party vendors, employee’s access points, and increasing IoT-based devices, such as printers and security cameras. Sandboxing solutions enable them to secure their connected computing devices from malicious activities. However, the easy availability of free software-based sandboxing solutions may restrict the growth of the sandboxing market. The major vendors that offer sandboxing solutions and services across the globe include Check Point Software Technologies Ltd. (California, US); Cisco Systems, Inc. (California, US); FireEye, Inc. (California, US); Fortinet, Inc. (California, US); Juniper Networks, Inc. (California, US); Palo Alto Networks, Inc. (California, US); Sophos Ltd. (Oxfordshire, UK); Symantec Corporation (California, US); Ceedo Technologies (2005) Ltd. (Netanya, Israel); Forcepoint (Texas, US); McAfee LLC (California, US); SonicWall Inc. (California, US); and Zscaler, Inc. (California, US). 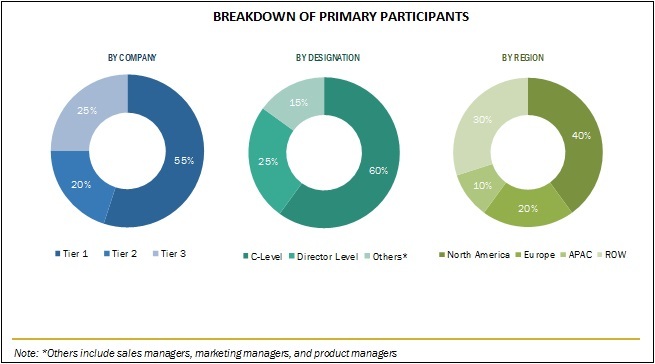 These vendors have adopted different types of organic and inorganic growth strategies, such as new product launches, partnerships and collaborations, and acquisitions to expand their offerings in the market. *Details on Overview, Product Offerings, Business Strategies, and Recent Developments Might Not Be Captured in Case of Unlisted Companies.